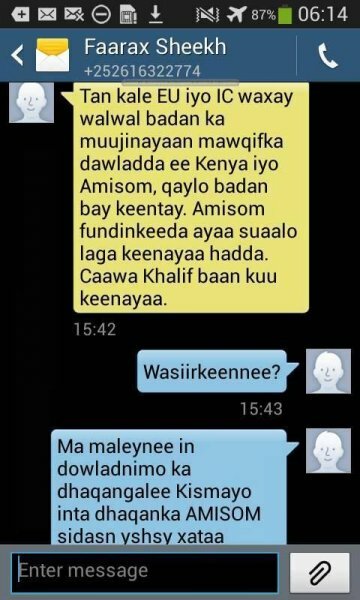 SOMALI AGENDA has received and verified the authenticity of series of SMS messages between Somalia's President Hassan Sheikh Mohamud and his powerful Justice and Constitutional Affairs minister Farah Sheikh Abdulqadir. The text messages exchanged between January 2013 and January 2014 offer a fascinating and revealing insights into the working of the Hassan Sheikh Mohamud administration and the incredible power men like Farah Sheikh Abdulqaidr wield in influencing public policy in Somalia. SOMALI AGENDA has obtained multiple collections of the SMS messages; however, due to security and safety of people involved has chosen not to publish the entire collection of the messages at this time. SOMALI AGENDA might revisit the remaining unpublished documents at a later date with the aim of enlightening and informing the Somali public how their government operates, and the way policies are formulated. Furthermore, these texts also provide insight into the roots of the current fundamental basis of political infighting between the Prime minister and the President and why the country is currently in a political gridlock. A significant portion of the SMS messages occur during the political conflict between President Hassan Sheikh Mohamud and his former Prime Minister Farah Abdi Shirdon. Then and now, Farah Sheikh Abdulqadir has been at the center of both political confrontations making the disclosures of these SMS messages significant in understanding the roots of Somalia’s political dysfunctions. Born in a small market border town between Kenya and Ethiopia approximately 1963, Farah Sheikh Abdulqadir hails from a religious family and from a very young age received his religious education. Following the collapse of the military regime of Mohamed Siyad Barre, Farah Sheikh Abdulqadir became the president of the Somali chapter of Africa Muslim Agency which was an influential charity organization supported by leading business community and governments of the Gulf countries especially Kuwait and Qatar. Farah’s involvement with the Africa Muslim Agency provided him with the crucial opportunity to cultivate ties among the powerful groups in the Arab world. These ties proved vital in 2012 when Farah Sheikh Abdulqadir engineered the political campaign of Hassan Sheikh Mohamud and successfully propelled a relatively unknown man into Villa Somalia easily beating established political heavyweights such as the then incumbent President Sharif Sheikh Ahmed. To say President Hassan Sheikh Mohamud is indebted to Farah is an understatement. Since the election of President Hassan Sheikh Mohamud, Farah Abdulqadir has personally overseen and approved nearly every critical piece of policy forwarded by the government raising allegations that Farah Sheikh Abdulqadir was the de facto president of Somalia. These allegations gained momentum during the firing of former Prime Minister Abdi Farah Shirdon in December 2013 when disagreements between the then State Minister for the Presidency Farah Abdulqadir and the Prime Minister ultimately led to the sacking of the prime minister by the parliament in a motion of no confidence engineered by Farah Abdulqadir. The texts obtained by SOMALI AGENDA are evidence to the magnitude of power Farah Sheikh Abdulqadir holds over President Hassan Sheikh Mohamud. Much of the correspondence between the two shows a remarkable power structure and who is in essence in charge of the decisions. What becomes evident is that there seems to be a tendency from the President’s side to constantly update, verify, and ask for permission from Farah. It is then Farah who will give the go ahead, or disapprove of some of issues which require decision. In principle, it becomes clear that the President is unable to move or decide on issues without approval from Farah. Some might argue that this is not entirely surprising given the role Farah has played in the election of President Hassan Sheikh Mohamud, or is there any other factor that contributes to the docility of the President of the Federal Government of Somalia? Regardless, the strange power relation between the President Hassan Sheikh Mohamud and Farah Abdulqadir is currently costing him a second Prime Minister and is putting the country in a political deadlock. This might explain why a minor cabinet reshuffle has become a major political crisis at a time Somalia is facing humanitarian disaster and with constant threats from Al Shahab. For President Hassan Sheikh Mohamud, the choice is simple: he either stays in power with Farah on his side, or the entire cabinet can fall. This is very unfortunate for the progress made in Somalia as well as denting the optimism the Somali people harbored for this administration, who are gradually coming to understand the dynamics behind the continuation of political unrest in the Somali Government: President Hassan Sheikh Mohamud will not continue without his strongest ally Farah Sheikh Abdulqadir.